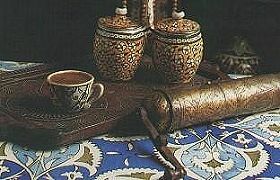 Volumes have been written about Turkish coffee; its history, significance in social life, and the ambiance of the ubiquitous coffee houses. Without some understanding of this background, it is easy to be disappointed by the tiny brew with the annoying grounds on which an uninitiated traveler (like Mark Twain) may accidently end up chewing. A few words of caution will have to suffice for the purposes of this brief primer. First, the grounds are not to be swallowed; so, sip the coffee gingerly. Secondly, don't expect a caffeine surge with one shot of Turkish coffee, it is not "strong", just thick. Third, remember that it is the setting and the company that matters-the coffee is just an excuse for the Occasion. a lion escaped from the Ankara Zoo and took up residence in the basement of an office building. It began devouring public servants and executives. It even ate up a few ministers of state and nobody took notice. It is said that a posse was immediately formed when the lion caught and ate the "tea-man", the person responsible for the supply of fresh tea! Among the beverages worth mentioning are excellent bottled fruit juices. But, perhaps the most interesting drink is "boza", traditionally sold in neighbourhood streets by mobile vendors on a winter night. This is a thick, fermentated drink made of wheat berries, to be enjoyed with a dash of cinnamon and a handful of roasted chickpeas. Boza can also be found year-round at certain cafes or dessert shops. 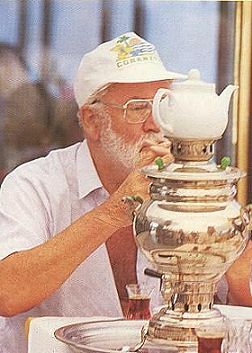 Finally, "sahlep" is a hot drink made with milk and sahlep powder. It is a good remedy for sore throats and colds, in addition to being delicious.